1 Blend 1/2 cup Italian dressing, lime juice and tequila in measuring cup. Pour tequila mixture over shrimp in large, resealable plastic bag; turn to coat. Close bag and marinate shrimp 20 minutes. 2 Remove shrimp from marinade, discarding marinade. 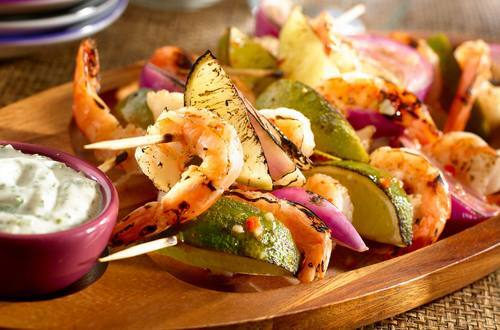 Alternately thread shrimp, onion and limes on 8 skewers*. Grill or broil shrimp, turning occasionally and brushing with remaining 1/4 cup Dressing, 5 minutes or until shrimp turn pink. Serve, if desired, with Mojito Mayo Dip. *Mojito Mayo Dip: Combine 1 cup Hellmann's® or Best Foods® Real Mayonnaise, 1/2 cup chopped cilantro, 2 finely chopped cloves garlic, 1 finely chopped jalapeno pepper, 1 Tbsp. lime juice and 1 Tbsp. white vinegar in small bowl. Season to taste with salt and ground black pepper. Makes 1-1/2 cups. **If using wooden skewers soak at least 30 minutes prior to use.